All enhancements in this newsletter are free enhancements to users who have the current version of our products. We recently added the ability to run Gage R&R reports in Minitab directly from the Buddy. Simply open any QC-CALC Gage R&R study in the Buddy and choose the Gage R&R Study or Gage R&R Run Chart from the Stats menu. The Buddy will automatically populate the Part, Trial, and Operator values in addition to the dimensions you have highlighted and run the studies directly in Minitab. Want to run Gage R&R studies and place them in Excel using Excel Jobs? You can place the graphs just like any other pictures into your custom Excel reports using the tags. In addition, we will actually read the Minitab Session window and allow you to place the Part Variation, Repeatability, and Reproducibility numbers anywhere in your Excel Reports. Just make sure you add a Gage R&R Study to your report so Minitab generates the GR&R numbers. Just one more way the SPC Office Buddy makes your life easier! In the Buddy, open a Gage R&R study you have performed in QC-CALC using File > Open. The filenames for this end in "_GRR.qcc" to help you identify one. By default, there is a Sample Gage R&R_GRR.qcc file included in the QC-CALC Data directory. Choose Stats > Gage R&R Study and watch the charts appear. You can also choose Stats > Gage R&R Run Chart to see the individual operator trials. If you have the SPC Office Buddy 3.2, then this is a free enhancement. Simply choose Help > Run Update or download the update from our website and start saving time on your Excel reports! 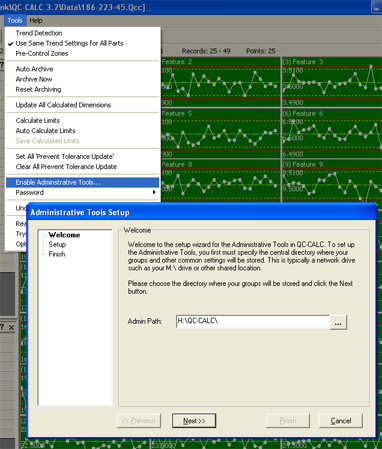 Setting Up the Administrative Tool - An Easier Way! As a refresher, the Administrative Tool allows you to centrally administer settings across multiple copies of QC-CALC in your shop. You do this by creating groups in the Administrative Tool and then choosing defaults and locked settings for each group. Once the group(s) are created, each copy of QC-CALC joins one of your groups and automatically inherits the settings of that group. When you change the settings for the group, all participating copies automatically get the new settings. It's a great way to standardize the settings of your QC-CALC copies without having to walk around to each gage station or CMM. To make it easier to set up, we have added a new 3 step wizard that will help you through the one-time setup in QC-CALC. If you currently have QC-CALC 3.2 (Real-Time or SPC) and do not see an Administrative Tools menu at the top, it means you aren't currently using the Administrative Tools. Just make sure to update to the latest revision of QC-CALC 3.2 so the feature appears. Choose a central path where your administrative settings will be stored. This is typically a department or corporate share on your network. Make sure it's a place to which all QC-CALC copies will have access (such as an M:\ drive, etc). Type or browse to the administrative path you chose in Step 1 and click Next >>. If this is the initial setup, you will be asked to type a new Admin password. Type the password twice to confirm and click Next >>. If there is already an existing admin folder, you will be presented with a screen that allows you to join a group. Simply choose the group from the list of groups and click Next >>. If this is the initial setup, the admin path you chose will be initialized for the Administrative Tool. If you joined an existing group, QC-CALC will now display the group name at the top of the window. In either case, the Administrative Tools menu will now appear giving you access to all Administrative functionality (provided you have the Admin password). If you have the QC-CALC 3.2, all you need to do is click Help > Run Update or download the latest update from our website. If you have an earlier version of QC-CALC, then it's a great time to upgrade and take advantage of all the new features in QC-CALC 3.2. You can download version 3.2 and install it into a different folder to try it out before upgrading since they don't interfere.